Take a small variety of potatoes to make Dum Aloo. Boil the potatoes but do not boil too much. Just stop the gas at 1 whistle in the pressure cooker and take out the potatoes. Peel the boiled potatoes and prick the peeled potatoes with a fork so that the spices can go well inside the potato. Mix potatoes with ¼ teaspoon turmeric powder, ¼ teaspoon of red chili powder and ¼ teaspoon of salt. Make a paste of tomato, ginger, green chilly and cashew nuts. Put the pan on the gas to fry the potatoes, add 2-3 teaspoons of oil and heat it. When the oil is hot, add potatoes in it and keep it frying until brown. When crisp and brown color spots come out on the potatoes, take them out in the cup. Now add 2 tablespoon oil in the pan and heat it. Add cumin seeds, cinnamon pieces, cloves, black pepper, large cardamom seeds and fry them lightly. Now add asafoetida, ¼ teaspoon turmeric powder, coriander powder, and 1 teaspoon Kasuri Methi and fry them lightly. Add tomato cashew paste in the spices, add red chili powder and fry the spices until the oil begins to separate from the spices. Now add 1 cup water in the spices and mix it. If the gravy looks thick, then you can add ½ cup of water. Mix the gravy with garam masala, salt, and a little green coriander. Put the potatoes in the gravy and give it a good stir. Cover the pan and let it cook for 4-5 minutes on a low flame, then check it. 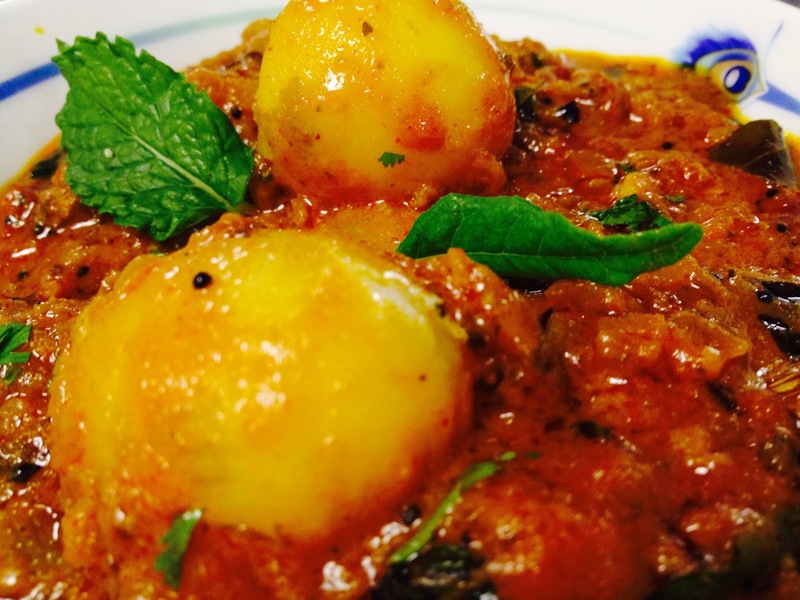 After 5 minutes, the Punjabi Dum Aloo is ready. Take it out in a bowl. Garnish this flavourful delicacy with green chili and coriander, and serve with choice of chapatis, parathas, naan or rice that appeal to you and enjoy its taste. If you want to deep fry the potato, do not mix the spices first. The gravy color is good only when the spices are well fried.